There are few things more striking than a beautiful fireworks display. Unfortunately, due to their very nature, fireworks are too dangerous for most situations. For that reason, Showven to develop the Sparkular, a revolutionary special effect that looks just like a classic pyrotechnic display, without all of the danger associated with fireworks. But you might be wondering, how do they work? Cold pyrotechnics are still very new, after being introduced just a couple of years ago, so it may have flown under your radar. With that in mind, we’re going to dive into the fascinating science that goes into making this cold spark machine work. If you want to add a Sparkular display to your next event, call us at Rythm EFX to learn more! Traditional pyrotechnics and fireworks require combustion and extreme levels of heat to operate. This makes them incredibly dangerous in lieu of how beautiful they are. They create fire hazards to expel carcinogenic particles into the air, which severely limits where they can be used. Pyro has been relegated to outdoor venues and large arenas to preserve the safety of the audience as a result. 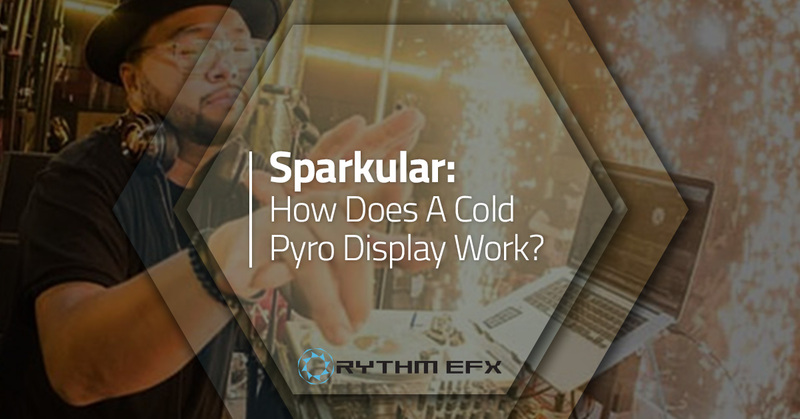 In contrast, Sparkular does not use flammable elements to create its sparkling display. Instead, it heats up small grains, which are made up of a mixture of zirconium and titanium. Those grains are loaded into the machine from small pouches that come with a safety interlock system. That safety must be activated to unlock the machine for operation, which prevents unauthorized or otherwise unapproved materials from being fired. Sparkular devices themselves are small rectangular boxes that can be connected to each other through a daisy-chain of cables. They also have a power switch and a reader to check the safety interlock, as well as 3-pin DMX ins and pass-throughs. Once connected, they can be controlled either with a DMX controller or a dedicated Sparkular controller. To operate the Sparkular, the composite grains are loaded into the machine. Each 200-gram package contains enough granules for around 10 minutes of firing time, in 90-second increments with a period for cooldown. That means there is no need to reload the device after a single shot, unlike with traditional pyrotechnic displays. The composite creates cold sparks that have a temperature lower than body temperature, and far lower than those of fireworks. How much lower? Sparklers, which many people consider to be a low-key firework, burn at a temperature of over 1,200 degrees Fahrenheit. Sparkulars, on the other hand, run at a temperature of around 62 degrees Fahrenheit. That makes them safe enough to hold your hand or a piece of paper over without danger of burns. Additionally, Sparkular produces about 80 percent less smoke than traditional pyro and leave virtually no odor behind. The lower temperature of the sparks and lack of smoke or odor make Sparkular a perfect effect for indoor events. An operator can control both the height of the sparks (up to 16 feet in the air) and the volume of the sparks by adjusting values on the controller. This makes incredible displays easy to create, unlike traditional fireworks requiring every effect to be a single-shot pyrotechnic device. You can program a number of tricks like chases, bumps, and other cool effects to launch right when you would like it to. One downside is the noise the machines create, though it is to be expected with any similar special effect. As one of the safest and most dazzling special effects in the industry, Sparkular can take a drab event and breathe new life into it. Whether you’re having an indoor concert or an outdoor performance, you can blow your audience away with this unbelievable cold spark fountain display. If you would like to learn more about Sparkular, call Rythm EFX today. We are the event production gurus of Northern Colorado. Take your next church event, wedding, or celebration to the next level with our amazing line of awesome stage effects. We hope to hear from you soon!